To have some idea what it’s like, stand in the outside lane of a motorway, get your mate to drive his car at you at 95 mph and wait until he’s 12 yards away, before you decide which way to jump. I think England will win a Test. My concern is Australia will probably win two. If Trescothick had tried to get me off the field when batting well, I’d have hit him with my bat. He was a top man and a good professional. He was one of those who you know will never play a trick and you can ask him to do anything for you and he will. An unassuming man and a great loss to us all. 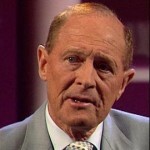 Geoffrey Boycott was born in Fitzwilliam, West Riding of Yorkshire, England. He is a former Yorkshire and England cricketer. In a prolific and sometimes controversial playing career from 1962 to 1986, Boycott established himself as one of England's most successful opening batsmen and since retiring as a player, he has found further success as a cricket commentator. He made his international debut in a 1964 Test match against Australia. After 108 Test match appearances for England, Boycott ended his international career in 1982 as the leading Test run scorer with over 8,000 Test match runs, earning an OBE for services to cricket. He was inducted into the International Cricket Council's Hall of Fame in 2009. He has written several books include: Geoff Boycott on Batting, Boycott: The Autobiography, Boycott on Cricket, Learn Cricket with Geoff Boycott, The Best 11, The Best XI, and Play Cricket the Right Way.